A forum to preserve the history of the PHILIPPI(y) de BUCELLI(Y) d'ESTRÉES family. Un forum pour préserver la mémoire et l'histoire de cette famille. Legal Notice: "Data privacy law allows you to ask for the deletion of your personal data and the one of your minor children. To do so, please contact the blog administrator." "Vous pouvez demander la rectification ou la suppression de toute mention vous concernant ou concernant vos enfants mineurs. Pour cela, merci de contacter le propietaire du blog"
Marie Magdeleine Blanche Geneviève was the second daughter of François Alexandre Nicolas Chéri DelSarte (1811-1871) and Rosine ADRIEN of the House of Philippy Bucelly d'Estrées (1817-1891). Marie Magdeleine studied at the Julian Atelier, also known as Académie Julian in Paris between 1877 and 1889. She was the student of Gustave Boulanger (1824-1888), Tony Robert-Fleury (1837-1911), and Jules-Joseph Lefebre (1834-1912). Later on Marie Magdeleine become a teacher of painting at the Julian Atelier (Source 2). She received "Honorable Mention" at a French Salon genre painting in oil. The painting was entitled "La Misère" (an old man and child begging). Marie Magdeleine was one of the teachers of the well-noted French painter and relative of hers Thérèse M. Géraldy (1886-1965), Chev. of the French Legion of Honor. Thérèse M. Géraldy was the daughter of her sister Marie DelSarte who was a sculptor (Source 4). 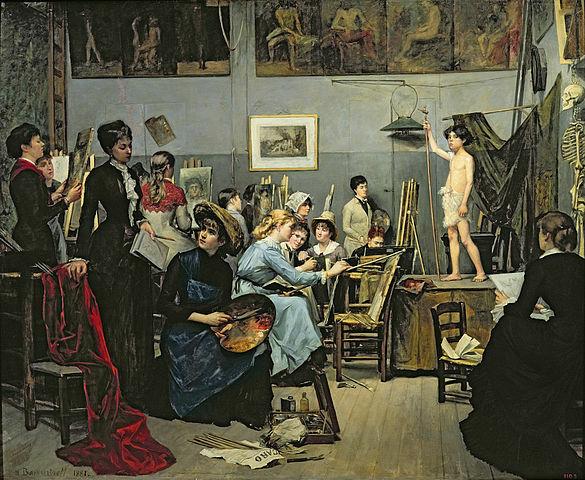 The Académie Julian was founded by Rodolphe Julian in 1868 a private art studio for students. Throughout the many years that the academy was opened, both teachers and students gained fame. 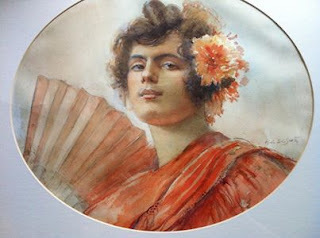 Among the most famous students were Marie Bashkirtseff (1858-1884) and Diego Rivera (1886-1957). Marie Magdeleine was a student of Tony Robert Fleury (1837-1912) and Jules Joseph Lefebvre (1836-1911), Source 4.
" MAGDELEINE REAL DEL SARTE (1853 – 1927) - VIE ET ŒUVRE" (1988). 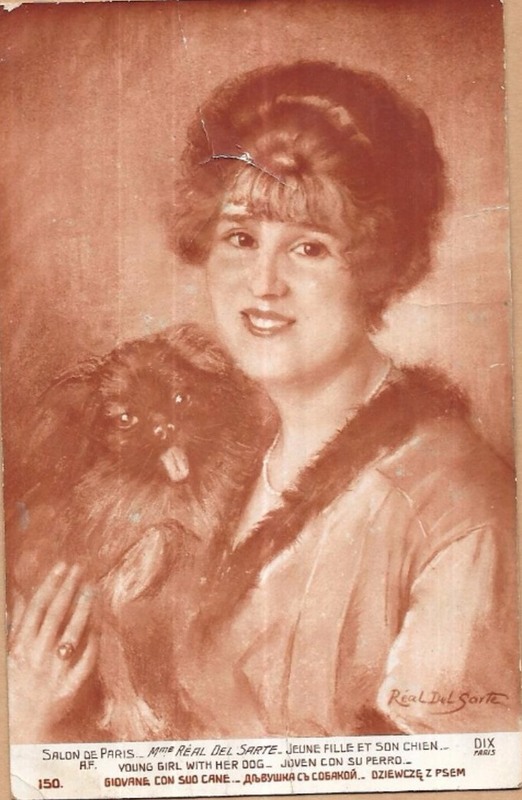 He is the descendant of Geneviève Réal del Sarte (1896-1974). 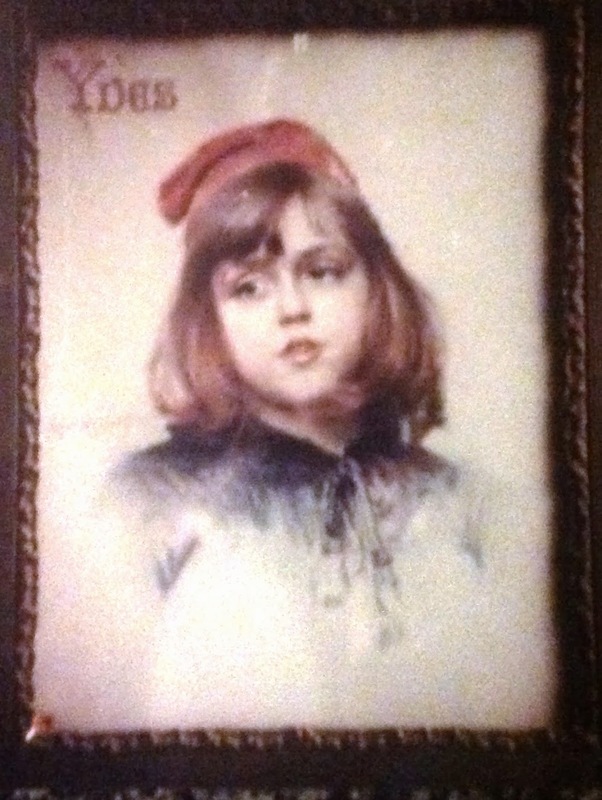 Geneviève was the daughter of Désiré Louis RÉAL and Marie Magdeleine Blanche Geneviève DelSarte. 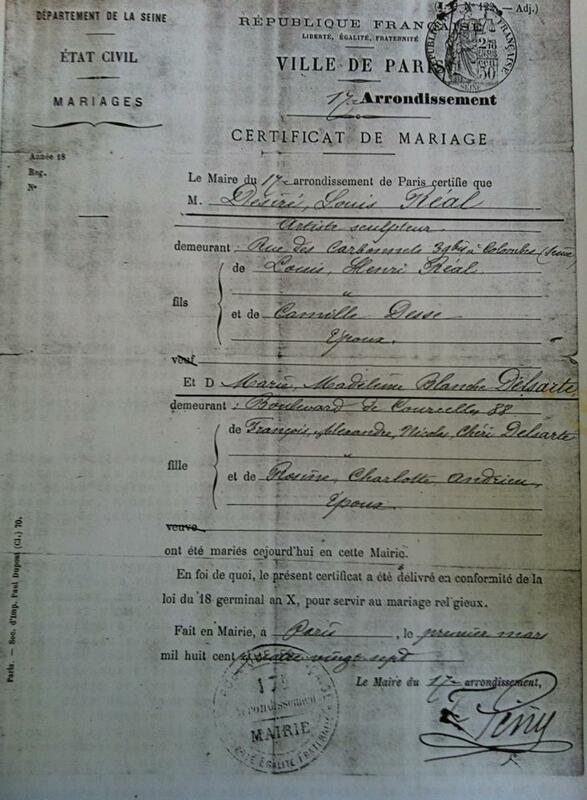 As the 1887 marriage certificate of Désiré Louis RÉAL and Marie-Magdeleine-Blanche DelSarte confirms, the "DelSarte" last named was spelled as one word. 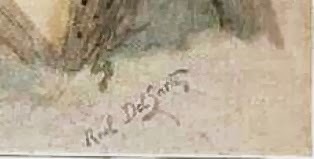 Although there was no legal change of spelling to the last name DelSarte, the family of Désiré Louis and Marie Magdeleine used in public the last name of RÉAL DEL SARTE as apparent in the Requiem card of 1909 of Désiré Louis RÉAL (see below). 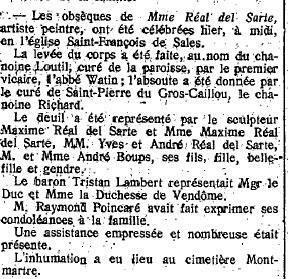 One possible explanation for the joining of these two last names was that Désiré Louis was a DelSarte through his paternal side. 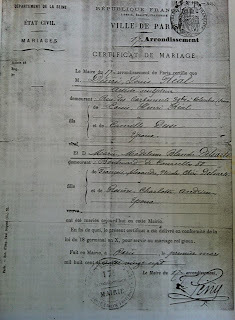 3) "Marie Magdeleine Blanche Geneviève DelSarte"
In any case, by government decree dated from July 31, 1961, the descendants of Désiré Louis RÉAL and Marie Madeleine Blanche Geneviève DelSarte have the legal right to bear the combined last names of Real and del Sarte (Source 22). If you are the holder of the copyrights of any of the images contained herein and believe that you have not been properly credited or would like your image taken down from this blog, please contact the "Blog Administrator" (Gaigneron de Marolles). 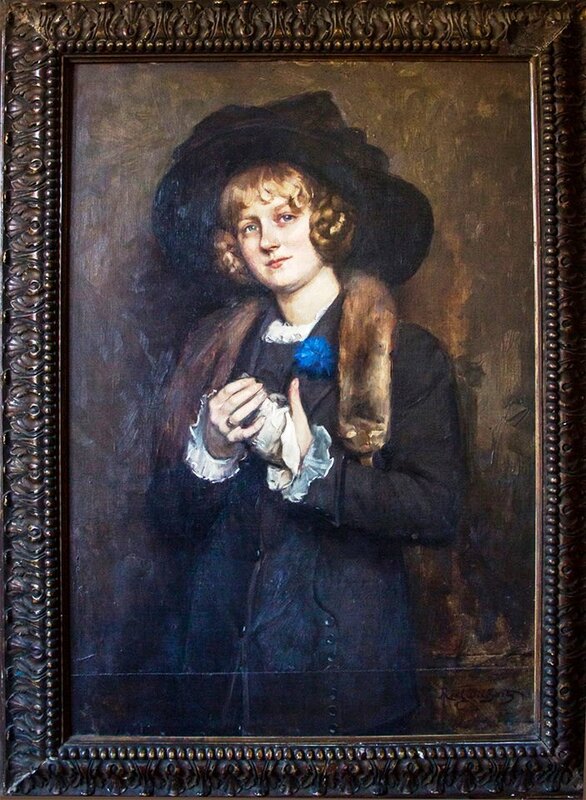 As for her artistic signature, it evolved from "Magdeleine DelSarte" to "RÉAL DEL SARTE"
In keeping with the tradition established by Désiré and Marie Magdeleine, their offspring and grand-children signed their name: "RÉAL DEL SARTE"
1877 - First exposition of portrait entitled "Melle L.." and "M. Del Sarte"
1881 - Marie Bashkirtseff (1858-1884), one of the best known female painters of the Academie Julian, painted Marie Magdeleine Blanche DelSarte (1853-1927) in the painting known today as "The Studio". Marie DelSarte, in a letter to the newspaper "Comoedia" dated from 1926 and referring to a newspaper article from February 4, 1926, clarified the mystery of who was the blond girl at the center of the painting. 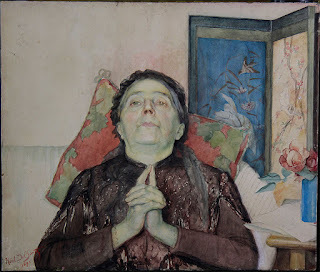 She said, "la personne du centre, en blouse claire, n'est pas Marie Bashkirtseff, c'est moi qui le lui ai posé" (Source 21). Moreover, Marie DelSarte stated that Marie Bashkirtseff is the one in black, facing the girls painting. 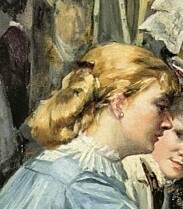 Most importantly, Marie DelSarte was the one that drew Marie Bashkirtseff. 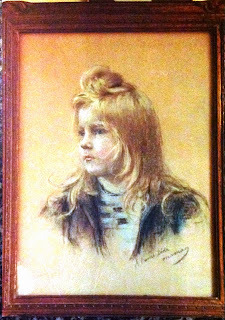 1880 - Exposition of her first huile: "Portrait of F. Del Sarte"
1890 - Marie-Mageline paints a boy in Calais. 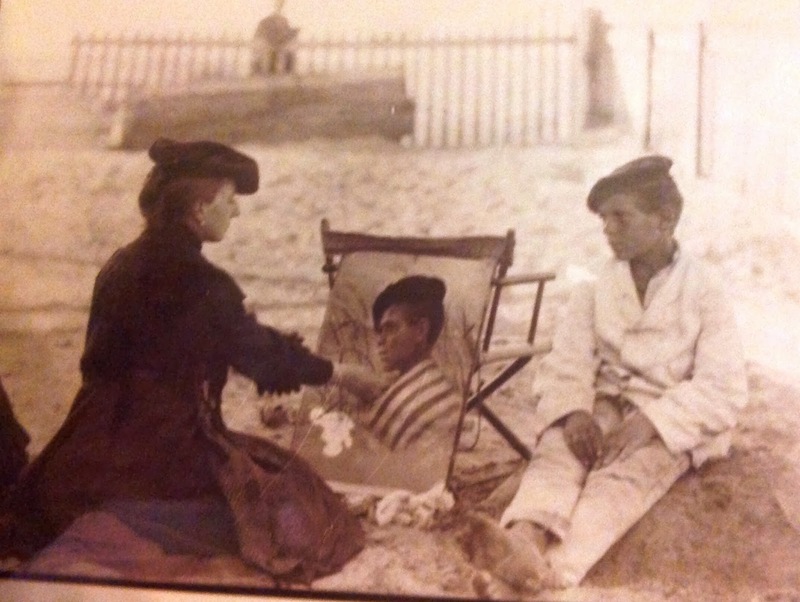 The "jeune matelot" was actually photographed while posing for Madame DelSarte. Thanks to the painting of the boy, the Blog Administrator was able to confirm that the image of the woman painting the boy was none other than Madame DelSarte (Source 21). 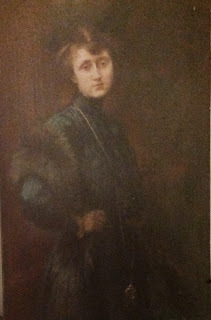 1891 - January 4 death of Rosine DelSarte (née Adrien of the House of Philippy Bucelly d'Estrées) Rosine was the daughter of Martin-Joseph ANDRIEN and Gabrielle Constance de Philippy de Bucelly d'Estrées. To this day, the descendants of Marie-Magdeleine-Blanche DelSarte and Désiré-Louis Réal del Sarte continue to be involved in the world of art. These relatives include the painter Philippe Réal del Sarte (1943-) and Caroline Marty-Réal del Sarte (1961-). Another, Mr. Bertrand Bedel de Buzareingues (1963-) is an art historian and well-established art restorer in Paris. 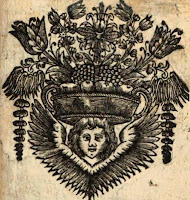 1) Bertrand Bedel de Buzareingues: Mémoire de maitrise d'histoire de l'art. Montpellier III. Magdeleine Real del Sarte (1853-1927),vie et œuvre (1988). 3) Jane Becker, et al. "Overcoming All Obstacles: The Women of the Académie Julian" (1999). Book has been partially digitized by Google Books. 2) Information provided on the life of Marie-Magdeleine-Blanche Réal del Sarte was taken from the Masters thesis of Mr. Bertrand Bedel de Buzareingues. The book was made available thanks to Mr. Olivier Real del Sarte. 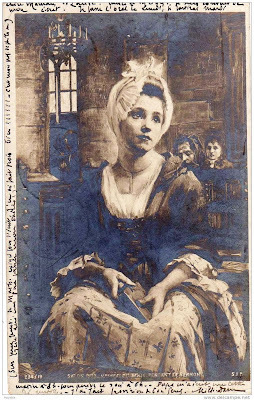 3) Image of Marie-Magdeleine-Blanche Réal del Sarte being taught how to paint was taken from the book: "Overcoming All Obstacles: The Women of the Académie Julian" , 1999, p. 74. 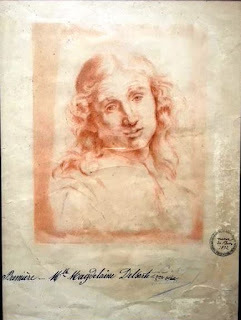 The caricature was taken from the album entitled "Croquis de Madame Gerladi". 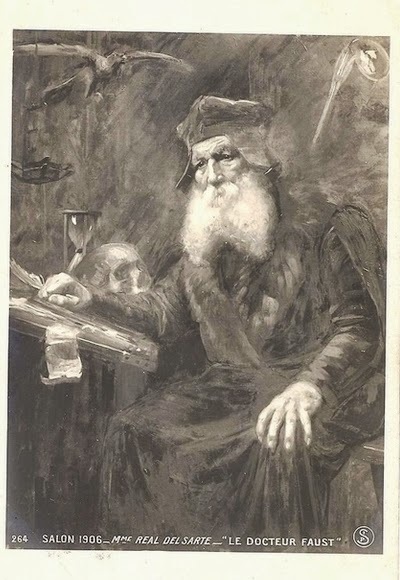 The sketch was done in pencil in 1876. The possible author could be Therese Geraldy.The last name was on purpose spelled with an "i". This could be an accident or that in fact we are talking about the same person. 4) Information on the teacher of M. Real del Sarte was taken from the website https://sites.google.com/site/academiejulian/ on Académie Julian. 6) The engraving of F. DelSarte by Marie-Magdeleine DelSarte was taken from the National Library of France (BNF). It is the most widely used image on the internet of F. DelSarte. 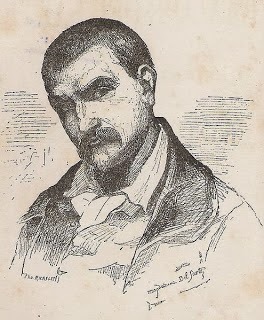 The engraving first appeared in a book on the Delsarte system published in English. 7) The original image was located on the website "delcampe" and was being sold as a post card. 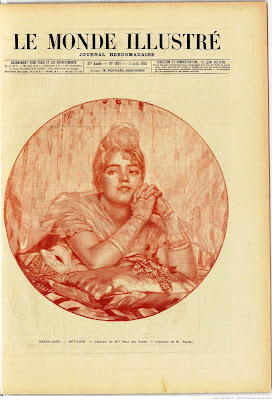 However, it appears that the image was actually published by the magazine "Paris Illustré". on 1/09/1888. 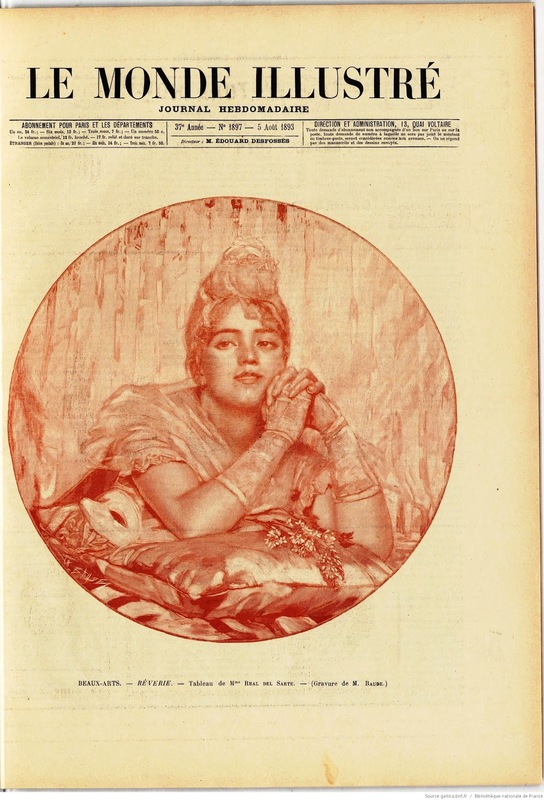 8) Paquita" by Marie Magdeleine DelSarte is the courtesy of F. Marty-Real del Sarte. 9) Drawing by Marie-Magdeleine was taken from the Gutenberg Project. Original title "Do you want a model". Now in the Public Domain. 10) Image received from Mr. Jean Catherine via e-mail. 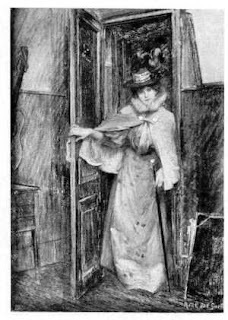 Originally published in "Le monde illustré" on August 5, 1893. 11) The image "Entre deux danses" was taken from Ebay. It is in the form of a postcard. 12) Image of Salon 1903 is the courtesy of delcampe website (http://www.delcampe.fr). 13) Image of Salon 1905 is the courtesy of delcampe website (http://www.delcampe.fr). 14) Image of Salon 1906 the courtesy of Mr. Bedel de Buzareingues. 15) The image of Thérèse Marie Rosine GERALDY is the courtesy of Mr. Bedel de Buzareingues via Mr. Olivier Real del Sarte. 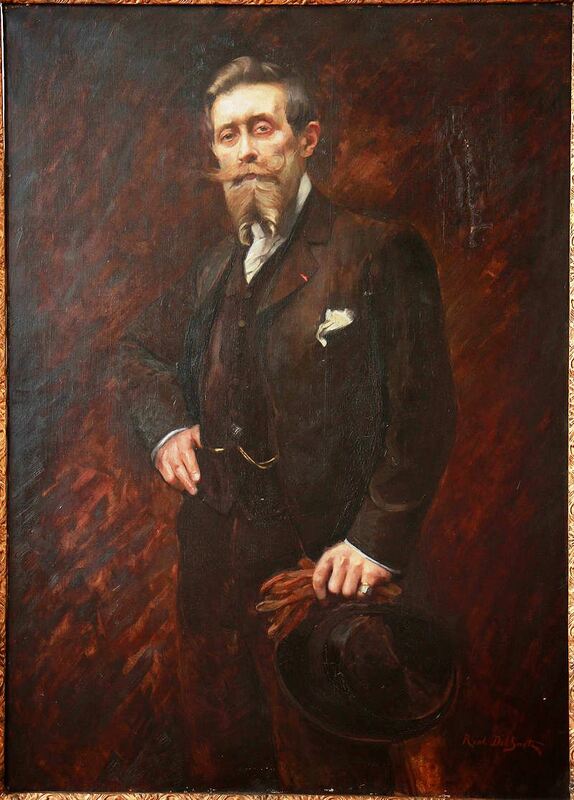 16) The engraving of F. DelSarte by Marie-Magdeleine DelSarte was taken from the National Library of France (BNF). It is the most widely used image on the internet of F. DelSarte. The engraving first appeared in a book on the Delsarte system published in English. 17) Image of Dr. Faust is the courtesy of delcampe website (http://www.delcampe.fr). 18) The image of the child in Calais dating from 1890 is the courtesy of Mr. Jean Catherine via e-mail. The image was originally placed in a website that specializes in antiques and paintings. 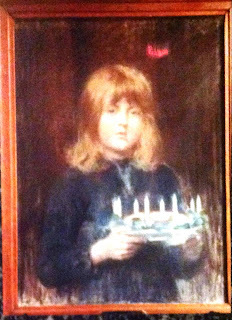 19) Images of paintings done by Marie Magdeleine DelSarte of her three children (Maxime, Yves, and André) were the courtesy of Mr. Bertrand Bedel de Buzareingues via Mr. Olivier Réal del Sarte. 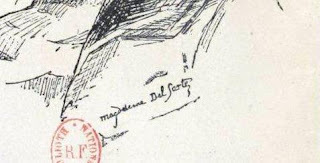 20) The chronology of the life and works of Marie-Magdeleine DelSarte was taken from the Masters thesis of Mr. Bertrand Bedel de Buzareingues. The original study on the life of Marie-Magdeleine DelSarte was conducted in French. Thus, the chronology represents the translation of the Blog Administrator. Moreover, the Blog Administrator has added certain dates to the chronology done by Mr. Bedel de Buzareingues. 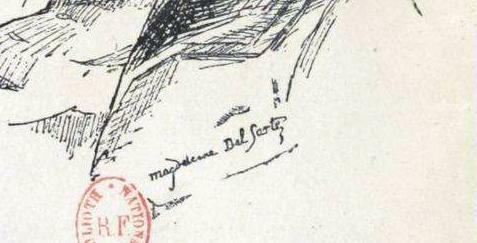 21) New information on the life and work of Marie-Magdeleine DelSarte was provided by Mr. Jean Catherine via e-mail. We are deeply grateful to him and his contributions. He is the author of the first Wikipedia in French on M. Real del Sarte and T. Geraldy. 22) Information taken from the study conducted by Mr. Pierre-Marie DIOUDONNAT (1997), Volume 4, into French families. 24) Portrait of a maid was done by Marie-Magdeleine Real del Sarte in 1888 and it was shown at the Royal Academy. 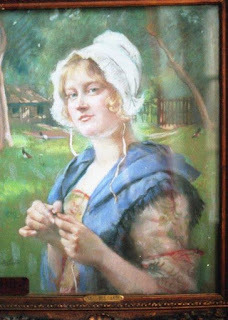 The portrait is of the maid of the artist. The portrait one first prize in London. 25) The image of Genevieve Bouts (née) Real del Sarte are the courtesy of Mr. Bedel de Buzarenigues and Mr. J. Catherine. The portrait dates from about 1912. 26) "Jeune fille et son chien" image was taken from the website http://delcampe.net/. There is no date to the image.